A big and a small American racer, and the famous J-class. One famous schooner had a, after more than 150 years, still resounding name: America. It was launched in 1851 and won the Cup which was named after her: http://en.wikipedia.org/wiki/America_(yacht). As Alex wrote a nice article on the America's cup, I'll leave that subject alone. 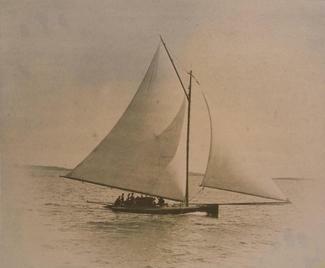 Another famous racing boat, recently restored to it's former glory, still resides in Mystic Seaport, U.S.A.
Years ago (in the pre-internet era) I found an ancient black-and-white photo depicting a small boat with a really enormous rig. With the help of some maritime friends and a lot of research I found out what it was: the Annie, one of the sandbagger racing class: http://www.mysticseaport.org/index.cfm?fuseaction=home.viewpage&page_id=B8CA154C-945E-5866-D842C3017C1CF16F. Quite an URL, isn't it? And, for this article, the last racing class is the J-class: http://www.jclassyachts.com/. For me it's the most beautiful America's Cup racing class, but the ships were so expensive to build, crew and maintain that (in America) only syndicates of wealthy businessmen entered ships for the races sailed by this class between 1930 and 1937. Pity for the Americans is that none of their ships have survived; only four remain, all British-built. One of them is Velsheda: http://en.wikipedia.org/wiki/Velsheda_(yacht). I'm happy a large photo of it displays its restored beauty on one of my walls.